Are you ever in the mood to bake but don't want to consume another batch of cakes and biscuits? I have the perfect solution- make some for your dogs! I received a dog biscuit cookbook many Christmases ago and fell in love with making treats for my favourites. Dan is especially appreciative which I love- he defiantly knows these are better than the cheap supermarket variety. These biscuits should make a perfect chewy treat and would be great for older dogs with bad teeth or difficultly chewing. 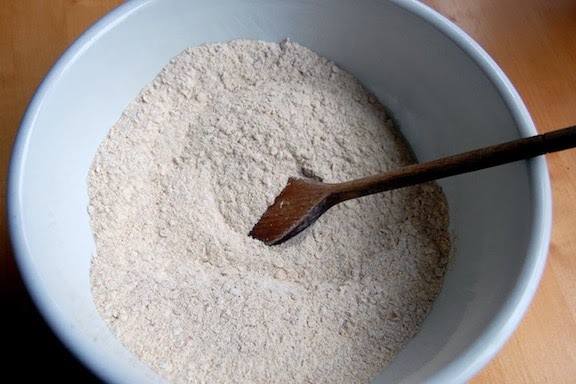 Mix together all the dry ingredients in a large bowl. Yes the first step is that easy. You should then gradually mix in all the wet ingredients- the eggs, oil, and stock. Keep going until it starts to form a dough. If the mix is still a little dry and not forming a ball then add a little water to help bring it all together. Once it has formed a ball transfer it onto a floured surface and knead it for 4/5 minutes. It should stick together nicely and be easy to work with it. At this point I divide the dough into two balls and put one in the fridge for another day. There is lots of dough and because of the time it takes to cook it is easier to do it in two lots. I rolled out the dough to about 1/4 of an inch thick and then used a bone shaped cutter. You can just use whatever shape comes to hand though. Then place them on a microwave proof surface. This is the part I found tricky because my microwave is difficult to control but you should put it on medium and cook the biscuits for five minutes on one side and five minutes on the other. Then turn them again and cook for another couple of minutes. Watch them though- you don't want them to burn. Have you ever make treats for your pets? That looks really fun - we tried making cat food for our kitties but they turned their noses up at it so we've never tried again! These look really good. If I had a dog I'd be making them to the point where my dog would be too fat to get out of the door.